Now I've never been one of those who gets up at stupid o'clock on the day of Black Friday just to grab a quick bargain...or two, and this year was no different! But that still doesn't mean that you miss out on all the good deals that are happening to be around. Being subscribed to certain websites/stores newsletters each month usually gives you a heads up as to what deals they are going to be offering and information on dates and times they will be happening aswell. This year Superdrugs sent out one of there usual newsletters and 9 out of 10 times I do click through and have a quick browse at what deals they are doing, and this time round I'm glad I did have a look at it. I had been on the lookout for a new electric toothbrush for a while now and not one that was run by batterys as ones that use batterys don't seem to last very long for me and I'm always having to replace the batterys every few weeks. After looking around for a while a few weeks ago I decided that I was gonna buy the Colgate ProClinical C250 which was priced at £49.99. 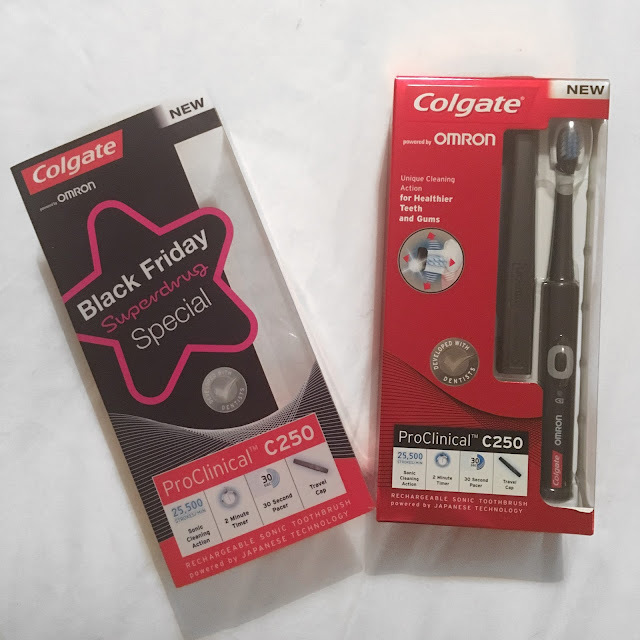 So after deciding this was the one I was gonna purchase, I headed over to the Superdrug website just to have a nose at there Black Friday deals and what was one of there offers.....It was the Colgate ProClinical C250 and the deal they had on was brillant! It was in there sale and down from £49.99 to just £17.49, what a bargain. So instead of ordering it online I popped over to there store in Cwmbran to pick one up and not only did I save money on it I also recieved triple points on my Superdrug beauty card aswell. The only downside is it doesn't come with a UK charger, its a US plug thats supplied so a UK adapter is needed to be able to charge this.